Many owners can be a little unsure about nail cutting. It’s very important to maintain the nails at the correct length to maintain the correct structure of the foot bones and tendons and to avoid sores. Dew claws also need regular checking as when left to grow, they can grow into the foot pad and can often get caught on bedding, sofa throws or while exercising, be ripped out or broken off causing immense pain and a lot of blood. 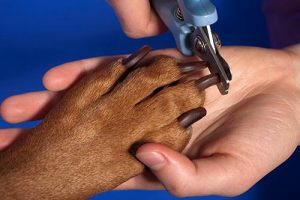 During a groom, your dog’s nails will be checked but if you require your dogs nails trimmed at any time do let us know and we can do this as a separate service for you. If you ring us beforehand we can arrange a suitable time for you to call in and it can be done while you wait with no need to leave your dog with us.